Chopping discarded apples for composting is one of the more difficult aspects of the process, report Apple Blossom School students Rowan Devoe (left) and Sophia Shordike. 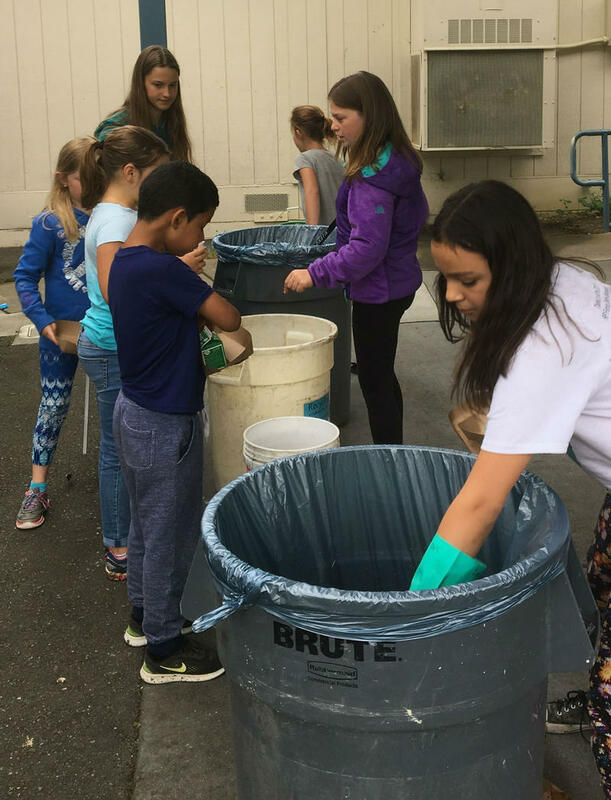 Apple Blossom School fifth graders Sophia Shordike (at rear) Rowan Devore (in purple jacket) and Kelyna White (foreground) help young students sort their lunch waste for composting and recycling. One good way to learn about sustainability is by practicing it. That’s what students at a Sebastopol campus are doing, through a hands-on composting project that is ten years old and going strong. The composting project is also supported by grants from the Sebastopol Rotary Club, and gift certificates from Mary’s Pizza shack. It will continue, on a scaled-back basis, during summer school.